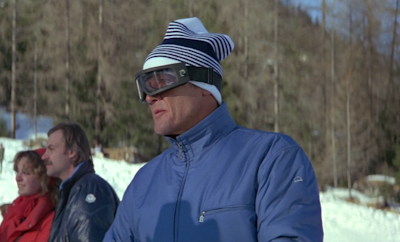 In For Your Eyes Only, Bond goes skiing in Cortina d’Ampezzo dressed in a ski suit from Bogner. The Bogner clothing brand was started by skiier Willy Bogner, Sr., whose son Willy Bogner, Jr. took over the company after his death in 1977. Bogner, Jr., who is also an accomplished skiier, was the cameraman who shot the complex ski sequences in For Your Eyes Only and in other Bond films. “B” logo of the zip fasteners are shown in many close-up shots to promote the brand. 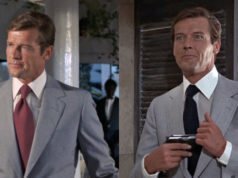 Not only does Bond wear Bogner clothes but so do some of the bad guys. Bogner’s skiwear is well-made and timeless. 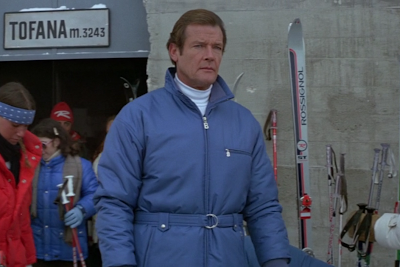 Bond’s Bogner light blue, zip-front ski jacket is hip-length and worn with a D-ring belt. There are three pockets: one horizontally across the chest on the left size, and two slash pockets at the hips, all closing with zip fasteners. The cuffs are elasticised. The back is one piece and darted at each shoulder. Apart from the “B” zip fastensers, there is an additional Bogner logo on the upper left sleeve that spells out the name under a hemicycle. 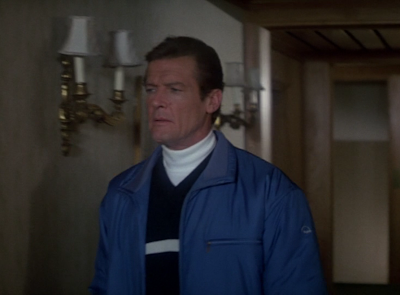 Under the jacket Bond wears two knit tops. The first is a navy V-neck jumper with a white stripe across the chest and two white stripes on each sleeve. Around the v-neck opening and down the outside of each sleeve is a knitted cable. Under that Bond wears a thinner white polo neck jumper. Bond’s Bogner navy ski trousers have a narrow leg with a zip-fastening at the bottom. The zip is on the outside of the leg and a Bogner hemicycle logo is on the inside. The trousers are worn over the dark and light blue two-tone boots, which have a tan sole. The navy leather gloves are also by Bogner and close with a “B” zip fastener. Bond wears a second, insulating pair of gloves under the leather gloves. A white wool tuque, or ski hat, with navy stripes tops off the outfit in the skiing scenes. A lot including the jacket, polo neck and V-neck jumpers, gloves and hat was auctioned at Christie’s in South Kensington on 12 December 2011 for £2,585. 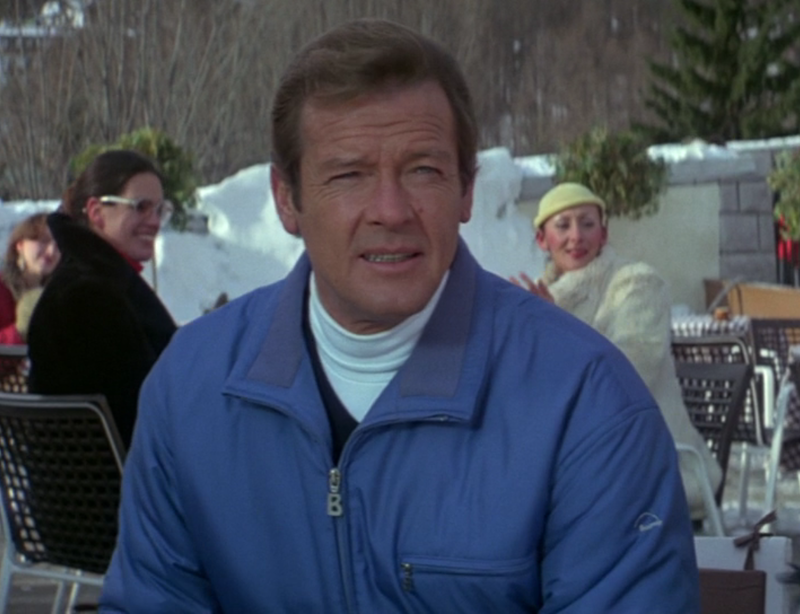 The white polo neck jumper is listed as having a zip at the neck, which means that it wasn’t the same one as used in the film. Excellent and timely post, Matt. I'm guessing that the white "polo" included in the Christies sale, with the zip, was the top that Moore wears with his other white Bogner ensemble at the beginning of A View to a Kill. Makes one want to hit the trails! Pretty standard ski ensemble that doesn't look outdated at all (unlike the pre-title sequence in TSWLM.) I believe Roger Moore wore Bogner in all of his ski scenes in the series. I remember when I first saw these films as a young boy I thought that the B on the zipper stood for "Bond." Quite a timeless fit, indeed. Like it! Although Bogner is quite pricey, they do produce some stunning ski clothes and might be worth the investment if you're skiing on a regular basis. @Kyle: ahahahah, I used to think the exact same thing about the B zippers. Not until the documentaries on the Special Edition DVDs did I learn it stood for Bogner. Oh boy. I don't know guys, I've always hated this look. The jacket is so puffy and cheap-looking and the color is very bright. I know I'm wrong, but I think it looks like something from a Walmart in South Dakota. I much prefer Brosnan's more form-fitting and muted ski gear in TWINE. Nice, classic look. Especially appropriate since Bond isn't skiing the entire time. When I was kid, for this first Bond film I saw in the theatre, I too thought the "B" zipper stood for Bond. I, for one, love the jacket and layered look. 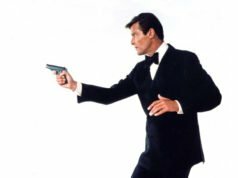 When you all thought the "B" stood for Bond, did you notice it on the bad guys too? Eventually (probably some point in the late 1980s) I figured out that the "B" must be a brand name. I did not know it was Bogner until I read this blog. Also thought the B stood for Bond, in FYEO as well as in VTAK. Did not notice the B on the bad guys though. Funny fact: Bogner has a really nice shop just next to Grand Hotel Pupp, Karlovy Vary. The same hotel that modeled for Hotel Splendide in Casino Royale. I have to put my hands up too Matt and admit that when I first saw these films as a boy, i also assumed the "B" was for Bond and to be honest I didn't really notice the bad guys skiwear too much. It was only when I met my wife, who is from Germany, and who had some Bogner pieces herself, that I made the association between the Willy Bogner on the Bond movie credits (whose name I had noticed) and the clothing brand. I live in Ireland and there isn't a Bogner store there but it is widely available in Germany. It must be also in the USA as I have spotted the signature "B" on clothing, from time to time, on American TV programmes. I like the layers and the knitwear but the jacket does look like something you'd get off a market stall. Does anybody know what brand ski goggles Bond wears in FYEO? I have looked everywhere and can’t find a similar pair!